Did my work experience in the computer department in 1977, at the Great Cambridge Road, Enfield, office. I was at Kingsmead School, Enfield, Year 4. Giant computers, giant hard drives, filing cabinets of punched cards, giant typing pool (for punched cards). Remember being told not to push "the big red button" on the IBM computer because it would freeze the computer and then told that previous work experience student had! Still remember my experience, drove past the only remnant of the old building the other day while driving on the A10. Lovely Art Deco frontage. Bought back memories. I too love Gor-ray. A keen wearer of second hand clothes for over 40 years (I'm 57 now) I still e=wear a skirt bought when such a thing was frowned upon. I have a lovely camel wool pencil skirt way too big for me! Id be really interested to find out more. I have great interest in GB clothes labels. Does any one know anything about Aubrey Segal? I worked for Gor-Ray in 1967-68 as Public Relations Officer, I ran fashion shows and wrote press releases for them. I still have a Gor-Ray mini kilt. I knew the company well. My mother worked at Gor-Ray in the early 1950s. She went there straight after she left school at 14yr. She would be happy to answer any questions. I am desperate to track down any previous employees from Gor-Ray Limited as I am conducting research into the history of the company. Any responses would be greatly appreciated. How nice to read these comments! I just found a Gor-Ray women's kilt at a flea market (in Finland!) in mint condition and of course leaped at it, it looks lovely and the colours are fantastic. Trying to find information on the manufacturer I came across this page. It seems I've found a gem and indeed I should think these skirts are in for a revival! Tartan is very much in fashion, and kilts are never out of it, come to think of it. Thank you all for sharing lovely memories and information, this has been a great time-travel, even if my memories with these skirts only started yesterday. They were fantastic skirts. I had several first bought in 1970 and they were worth every penny. You really could sit in them all day in the office and the pleats were perfect. Such quality and gorgeous colours. Just reading about the GOR-RAY kilt. I have just listed a beautiful full length one on ebay in perfect condition if anyone is interested. Gor ray kilts, the Bain of my life. My mother used to work there in Enfield and she would bring home vast quantitys of these kilts and we would have to sit there and pull the threads out to make the fray down the front. Just seeing the name provokes those images of them kilts all round the dining room. My mother must have hundreds as they would have staff sales and sell them next to nothing, all our school skirts were gor ray. I even did my work experience in there computer dept. now I look back the computer was as big as a car in its own room and it had no keys you had to feed it hole punched cards. 1977 . Those were the days. Loved my gorray skirts in the seventies and eighties. The pleats were so flattering and always looked perfect. I used to wear them to go out partying! Imagine wearing one now. I think its time for the revival of this line, they've revived Biba etc. Making the banner now bring back Gorray. 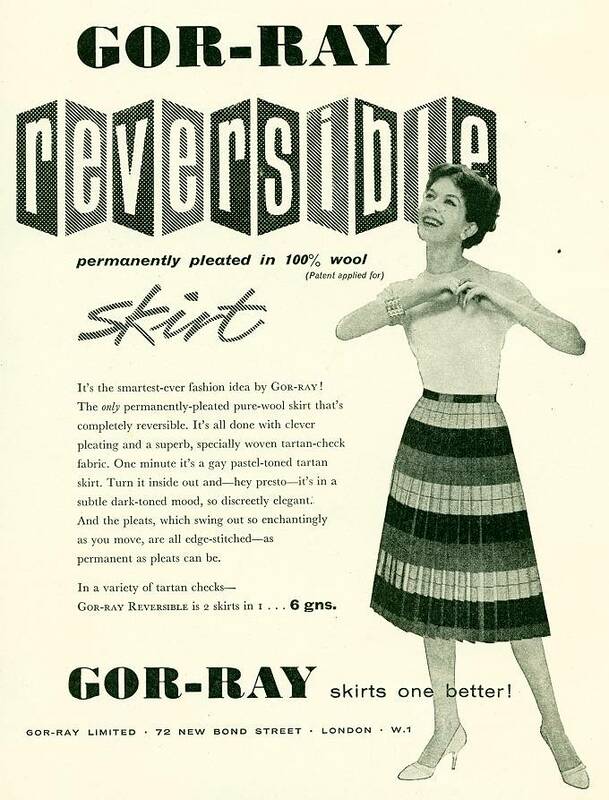 I remember my first gor-ray kilt in 1964 - the price was DM 175,00 - very expensive. 10 Years later I send it in the former DDR, and it looked like brandnew. My last gor-ray I bought in 1988 and I wore it for 20 years. I hope that gor-ray will have a revival - I'm looking for a new kilt in this quality! This is fab idea, it makes you wonder why we don't have them today.